Once again it's new release day at Sandra Caldwell's Etsy store and this one like so many others is just way too fun to use and color. 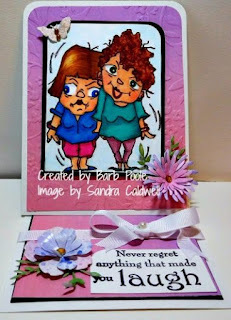 The name is Girl Friends and if you visit Sandra's store you will find quite the selection of fabulous, heart warming images, newly released ones todday as well as the many others released earlier. Sandra also has a fun Facebook group where there is a progressive challenge taking place and you can drop by sharing your creations with us. This is my last posting as a Guest on her design team and I have to admit it was a fun time for me, with some wonderful people to work with. 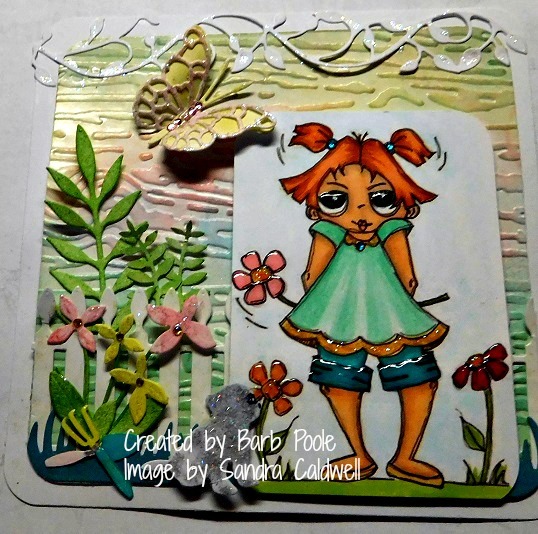 This is my card for the new challenge on Come and Get It with the theme being: In The Garden. Fred She Said is our wonderful sponsor for this challenge. I'm using an image from the Doodled Flower Trio, it comes with many more coordinating images all in one pack. I do hope you will come and join in this challenge sharing your creations with us. This is Meg and Bubbly the image is from Sasayaki Glitter Digitals, I thought they were such an adorable couple along with so many, many more of their images. Fun to color as well. It's Monday and this means it's new release day for Sandra Caldwell's newest digis stamps. This little cutie is named Lil Traveler I think she is just adorable and, too fun to color. You can join us at Sandra Caldwell's Facebook group and see her along with other new images being released today. There is also a progressive challenge taking place which you can join in sharing your creations. You may also want to visit Sandra's Etsy store to view all of her other wonderful heart warming images. This is a new image by Sandra Caldwell and his name is Hoots an American #332 you can find him and more wonderful, heartwarming images at Sandra's Etsy store. There is also a Sandra Caldwell Facebook group where there is an ongoing progressive challenge and sharing of group member's creations, pop on over and join us. 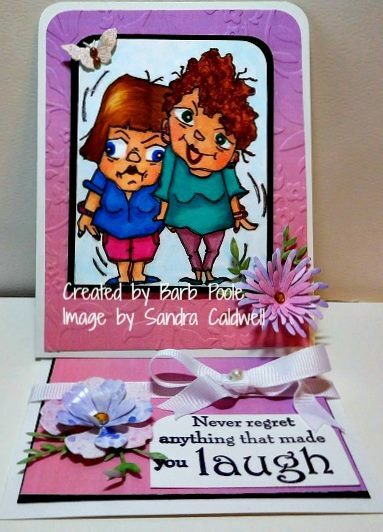 Tomorrow is Sandra Caldwell's new release day for her newest images. I decided to do a journal page for the new challenge which begins to day at the Come and Get It, the them is: Spring/Easter. 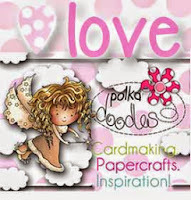 This week we are sponsored by Polkadoodles where you will find a beautiful selection of image, papers and so much more. On this page I have used Wesley a charming rabbit by Polkadoodles, he is just so darn cute. The background is sponged with Distress Inks, Wesley is colored with Copics and I've added a few die cuts, the sentiment is from my stash but I don't remember where I purchased it. I hope you will come and join in this challenge sharing your creations with us as I do get inspiration from visiting your blogs. I have the privilege of being A Guest member on Sandra Caldwell's Design Team for the month of March, in her Facebook Group. I'm using one of Sandra's brand new images named Picking Flowers #324, you can find her at Sandra's Etsy Store Plus so many more delightful and wonderful images. Every Monday Sandra posts some wonderful new images. I hope you'll come on over and join in the group where there are sometimes a challenge or contest in progress or just to share your creations with us. 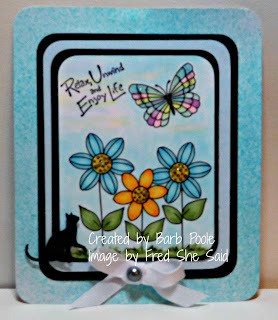 Hello, thank you for stopping by, today a new challenge begins at the Julia Spiri's challenge blog with the theme being Anything but a Card. I decided to make a tag using the image Dress part of the new Parisian Collection you can find them here at the Julia Spiri Etsy Store where you will find a wonderful selection of beautiful images. 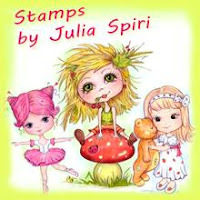 Julia's Facebook group where you'll find a different challenge and members share their work and more. I hope you'll come by and join us as I gain inspiration from visiting your blogs. Good morning and thank you for stopping by. This is my card for the new challenge which begins today at Crafting for all Seasons. I think it's a fun, easy theme: Add Some Sparkle. Ballet Fairy by Scrapper's Delights, she is on sale right now for 30% off. They have a wonderful selection of images and so much more in their store. This gorgeous image was generously given to members of the Scrapper's Delights Facebook group. I hope you'll join in this challenge sharing your creations with us.